Its almost prelims time and as promised we bring you our PRELIMS CRACKATHON series. 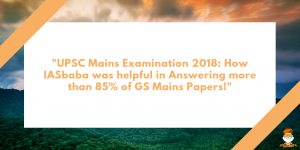 A series of videos (History, Geography, Polity, Economics, Science & Technology, Environment) by our former students and UPSC Topper’s who have made us proud (viewing & sharing their tips and strategies for Prelims 2019 )and discussion of few important questions for this year’s prelims totally free for everyone concerned. How to make the best use of the discussion videos? Watch the videos after a tiring day of preparation and see how much of your revision is up to the mark. Also, follow our 60 Day Plan sincerely! Based on your feedback more series on Mains pattern.